If the flames from your burner look yellow, uneven, or smaller than normal this indicates there may be food debris in the gas burners or jets. You can remove the burner and look for blockages and clean the parts thoroughly with warm water and detergent. Don’t use harsh chemicals or wires as this could cause damage and make the problem worse. 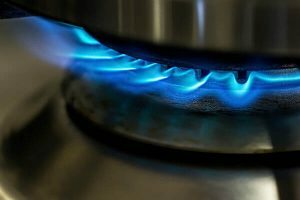 If the smell of gas is stronger than usual then you may have a gas leak from the hob. Turn off the hob immediately and ventilate the room. Don’t try to fix this yourself as you need a gas engineer – it’s worth considering asking for a gas detector to be installed that sounds an alarm if the levels exceed safety thresholds. 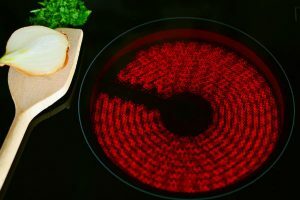 This is an indication that the cooking plate element may be faulty and you’ll need a repair or replacement as it may have shorted, burned out, or broken. If your pans have uneven bases this can also contribute and you may need to consider buying new ones. If the heat level can’t be adjusted no matter what you do with the settings this could be a sign that the ignition switch is faulty. You’ll need to turn off all switches, unplug the burner, and fit it into a different receptacle to see if that one works. Any non-functioning switches will then need to be replaced. Check the thermostat too if you have access to a multimeter. When you turn on your electric hob and the trip switch kicks in you need to unplug appliances on the same circuit and reset the fuse box. If this keeps happening you need to call in a professional as the circuit could be overloaded or the power plug could be damaged. Ceramic can be cracked or broken by dropping lids and surfaces can easily be scratched, and they’re not cheap to replace. You’ll also need to invest in special cleaners to avoid damaging the finish and possible new cookware as they don’t work with copper-based pans. The E symbol is an indicator that you’re continually pressing a switch – even when you aren’t! This can happen due to accumulated dirt resulting in a short circuit, or due to a faulty touchpad. You can clean the hob, turn the power off and back on, but if that fails you may need to replace the touchpad. Need an experienced cooker repair technician? Cooker repairs can be carried out swiftly and effectively by trusted professionals – all you need to do is call a reputable company such as Exclusive Repairs. You’ll be able to get a fully insured service and a six-month quality guarantee. Get a short notice booking and have your cooker repaired by specially trained staff using modern tools and equipment.